"I am a woman with a beard," writes Allison Landa. 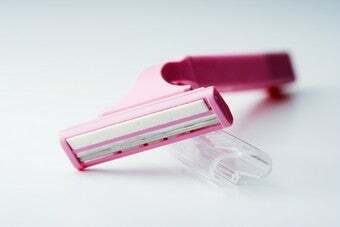 And so unfolds a story of hair removal that challenged some of our ideas about beauty, body politics, and choices. It feels like someone's going fishing in my face. The laser is like a roving fishhook. Each time it bites into my skin I hear a beepbeepbeep. That's the beam seeking the follicle. Once found, it goes zap. That's the hair frying. Not only can I feel it, I can also smell it. If this description appeared in Vogue, as part of their standard monthly piece about the latest cosmeceutical procedure, I'd probably be making fun of it right now. I'd be asking something like, Why would you pay money to let someone go fishing in your face? But here the answer is obvious: so you can stop asking, Are they looking at me? Those of us who critique contemporary beauty standards often set up a strange kind of opposition — body modification is stupid, we imply, unless there's something really wrong. Unless you have a condition. Unless you're somehow different enough that such modification is somehow warranted. I've slipped into this kind of rhetoric before, but reading Landa's piece reminded me that I'm not really the one to judge what is and isn't "warranted." As much as I might dislike the pressure on women to look a certain way, and to maintain this look through a variety of products and procedures, it's not really my place — or anyone's — to evaluate an individual woman's decision to change something about her body. Often, that decision may be informed by a variety of experiences and feelings that I as an outsider really know nothing about. But how do we keep the critique of social pressure separate from critiques of actual women? Can we rail against the beauty-industrial complex while still affirming women's right to do what they want? This question actually gets to the heart of a big conflict within contemporary feminism — many of us today don't want to criticize one another's choices or have our choices criticized, but we're still dissatisfied with the way these choices are constrained. If there's an answer here, it lies in the loosening of these constraints. We should be working for media representations of a wider range of women, so that we're not all pressured to look like a single ideal. We should expose the advertising tactics that try to sell us insecurity. We should be fighting street harassment and bullying so that all people can feel safe, no matter what they look like. And if we succeed in these goals, then we can quit worrying about other people's choices, because we'll know they're truly free to make them.